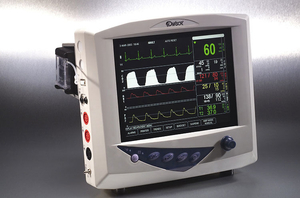 A multi-parameter monitor, as its name indicates, is used to keep track of a patient's different vital signs. These devices are mostly used in intensive care and other hospital departments to monitor patients in their beds. They are also found in emergency services. ECG, respiration rate, blood pressure, temperature and other data can be measured. Specialized versions include fetal, cardiac output and neuromuscular monitors. There are also veterinary models. Most of these machines are compact, some with a handle for easy transport. Those with a touchscreen offer enhanced ergonomic characteristics. Wireless network-ready versions are useful for transmitting data to central monitoring systems in hospitals so that multiple patients may be monitored remotely. Choice depends on the number and type of parameters to be monitored.